Have you guys ever found a great sale on yogurt only to find you bought WAY too much? More often than I care to admit I’ve ended up chucking yogurt in the trash because I bought more than my family is in the mood for so I found this FABULOUS idea for putting all that yogurt to good use! 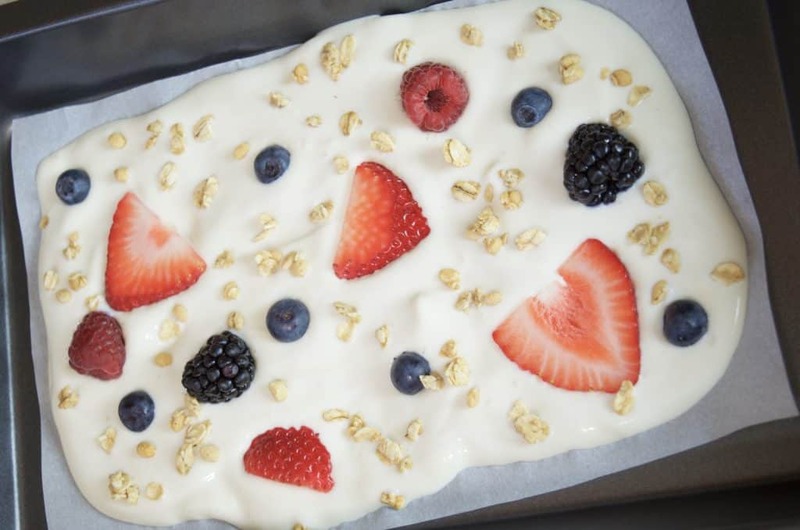 Make a frozen yogurt bark recipe!!! Then you can just pop it out of the freezer to eat anytime you want! 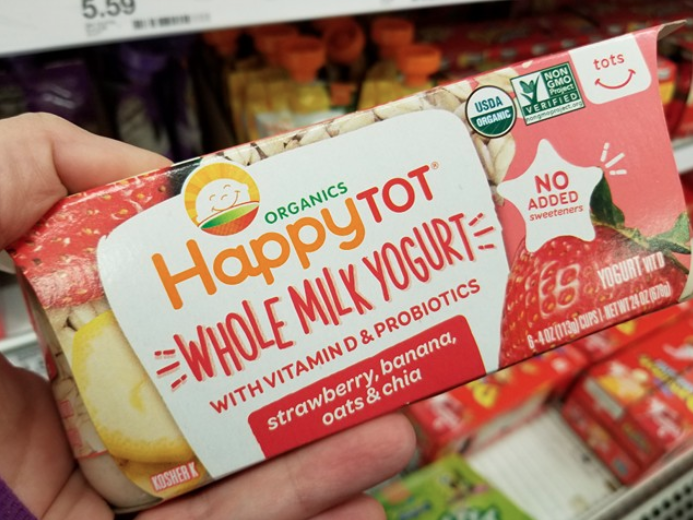 For this recipe I wanted a good wholesome yogurt for my toddler as well as my older kids so I picked up some Happy Tot Whole Milk Yogurt Cups. These can be found at Target but they are *NOT* in the baby area!!! You will find these in the REGULAR yogurt refrigerated aisle! There are NO added sweeteners, it’s non-GMO and of course has vitamin D and probiotics for happy tummies. My Target had 3 flavors to choose from: Strawberry, Banana, Oats & Chia; Apple & Pear; Apple, Mango and Carrot. 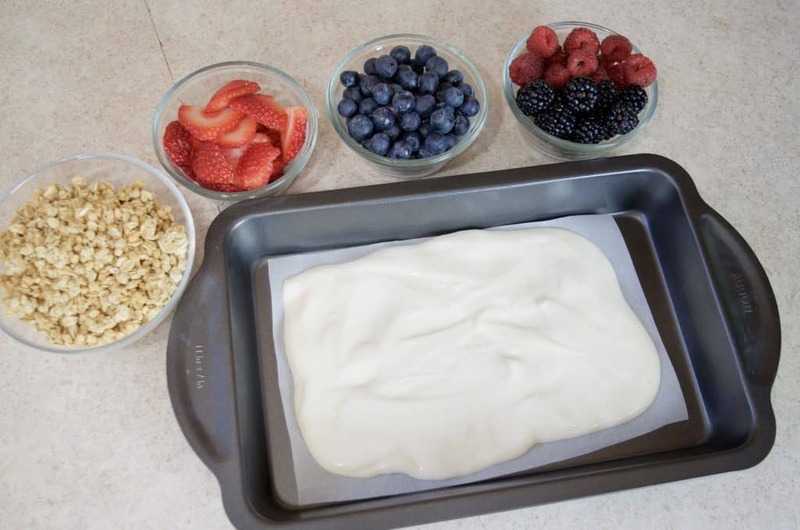 Line the bottom of a baking pan with parchment paper. Pour yogurt on top. 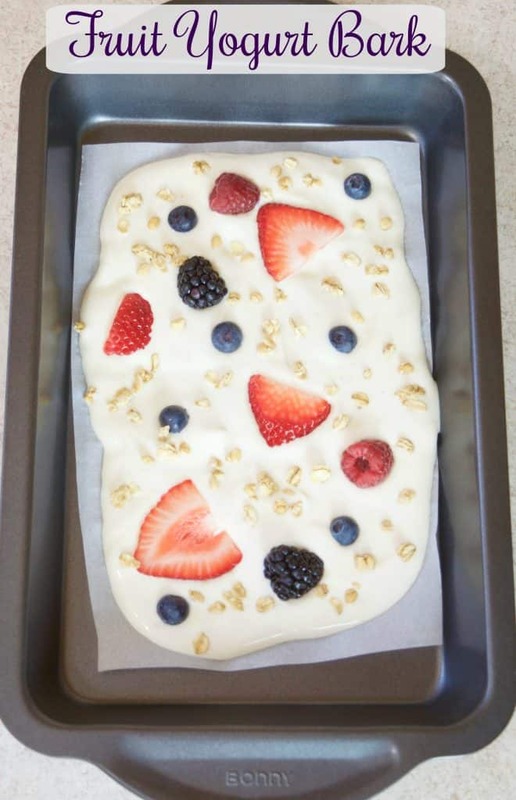 You do not need to fill up the pan, just pour it onto the parchment paper and try to even it out a little like I did in the photo above. 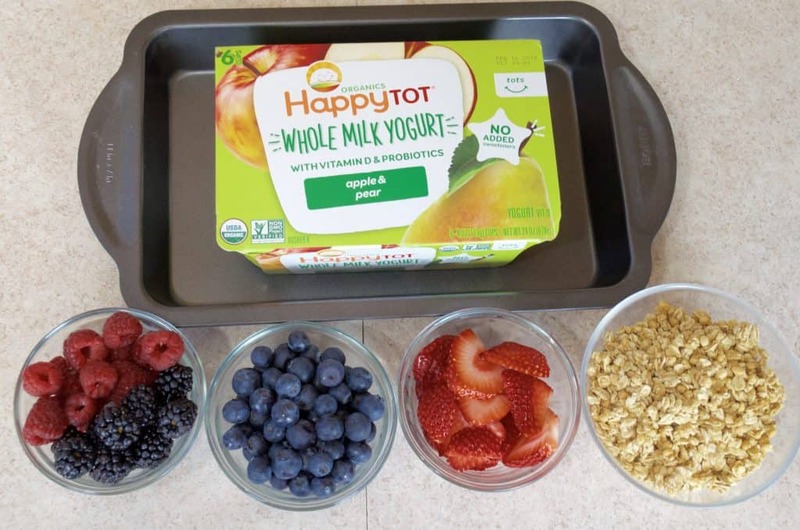 Sprinkle granola and fresh fruit onto the top of your yogurt. You may want to slightly press your berries down into the yogurt. Place the entire baking pan into the freezer until solid! 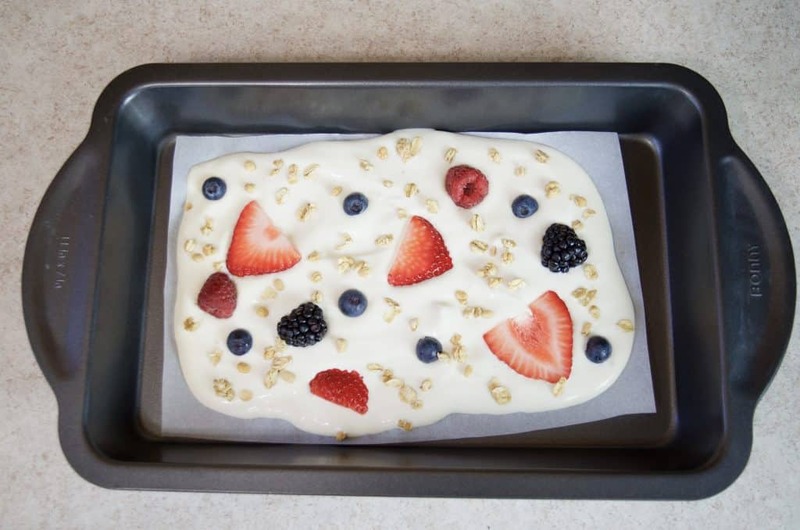 Then you can store your Fruit Yogurt Bark in sheets like this or break it up and store it in ziploc bags or storage containers. 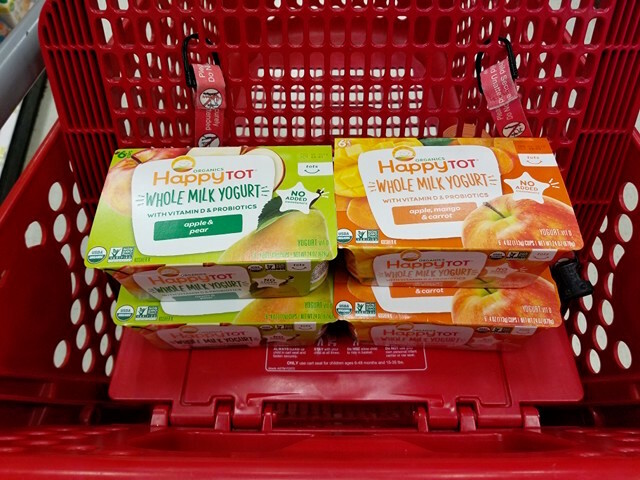 Remember to look for Happy Tot Whole Milk Yogurt cups in your local Target yogurt aisle or check out all of the flavors and options here!